Son of Samuel, who, with his elder brother Joel, judged Israel in Beersheba. Their inefficiency and venality were the ostensible reasons that induced the elders of Israel to petition Samuel to appoint a king over them (I Sam. iii. 1-5). Some rabbis endeavor to exculpate Abiah and his brother in part from the charges against them referred to in I Sam. viii. 2, 3. By Akiba and his disciples it is maintained that the offense of the sons of Samuel consisted in the inconsiderate and proud manner with which they appropriated what was theirs by right, or in exacting more than was their due. Others goso far as to declare that their sole offense consisted in the fact that, unlike their father, they did not travel about the country in order to ascertain its condition, but established themselves in one place, surrounded themselves by a royal court, and left the people to be exploited by officials (Shab. 56a). Others, again, assert that Joel and Abiah were originally wicked, but that they improved to such a degree that they were found worthy of prophecy (Ruth R. on ii. 1). On the other hand, PseudoJerome, in his "Commentary on Chronicles" (vi. 14), undoubtedly following Jewish tradition, declares that Abiah, the judge, was the only sinner, but that his brother was blameworthy because he had not endeavored to turn Abiah to better ways. See Joel, Son of Samuel. Rahmer, Ein Lateinischer Kommentar zu den Büchern der Chronik, pp. 29-31, Thorn, 1866. Son of Jeroboam I., king of northern Israel, whose story is told in I Kings, xiv. 1-18. He having fallen sick, his mother went in disguise to the prophet Ahijah to inquire as to the prospects of her son's recovery. Ahijah, recognizing her, informed her that the child would die, and at the same time, predicted the calamities that were to befall the kingdom. The narrative in the accepted text associates all national disasters with the religious apostasy of Jeroboam. The Septuagint (Vatican and Lucian) has a briefer narrative; and critics have pointed out that this simpler, and presumably earlier, form of the story deals with a stage in Jeroboam's life antecedent to his public career, to which it makes no reference whatever (see H. Winckler, "Alttestamentliche Untersuchungen," pp. 12 et seq.). The passage, I Kings, xiv. 13, in which there is a reference to "some good thing [found in him] toward the Lord God of Israel," is interpreted (M. Ḳ. 28b) as an allusion to Abijah's courageous and pious act in removing the sentinels placed by his father on the frontier between Israel and Judah to prevent pilgrimages to Jerusalem. Some assert that he himself undertook a pilgrimage. The second king of Judah, son of Rehoboam. His reign lasted three years (B.C. 918-915). From the account in I Kings, xv. 1-8 (where he is called Abijam), it would appear that he was a wicked ruler, "who walked in all the sins of his father," and that it was only for the sake of David, his ancestor, that the royal line was continued in him. "God gave him a lamp in Jerusalem to set up his son after him, and to establish Jerusalem: because David did that which was right in the sight of the Lord and turned not aside from anything that he commanded him all the days of his life, save only in the matter of Uriah the Hittite." The only other matter there touched upon is his relations with the northern kingdom, as to which it is merely said that there was constant war between him and Jeroboam I. In II Chron. xiii. much is said of Abijah, and all of it with direct or implied approbation. Indeed, no two accounts of the same person could be more contradictory. In I Kings, xv. 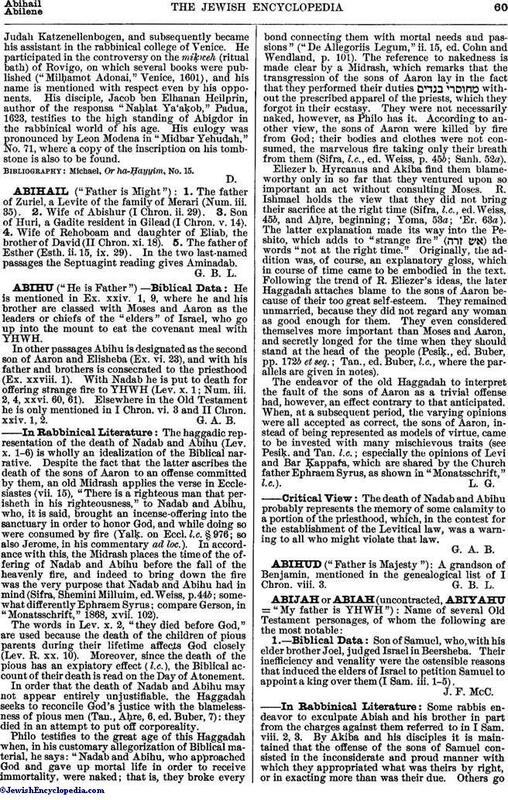 2, his mother is said to have been Maachah, daughter of Abishalom; this is confirmed by II Chron. xi. 20 in its account of the reign of Rehoboam. But in II Chron. xiii. 2 she is called "Michaiah, the daughter of Uriel of Gibeah" (see Targ. Chron. for the rabbinical view). 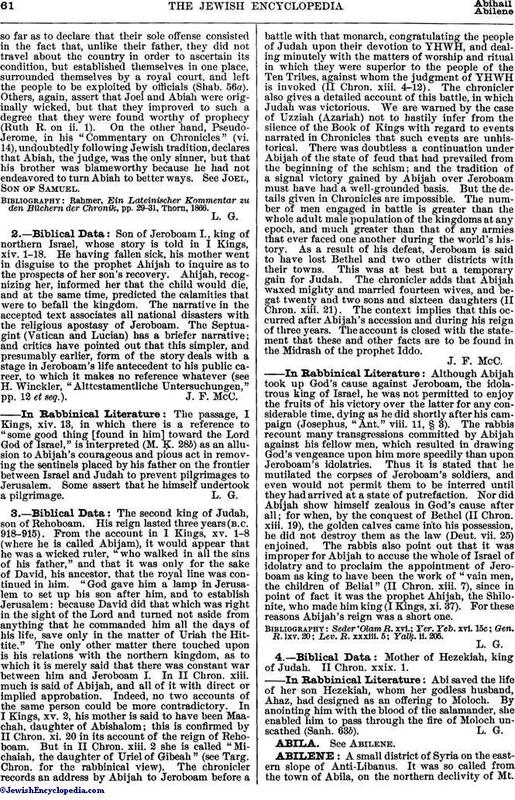 The chronicler records an address by Abijah to Jeroboam before a battle with that monarch, congratulating the people of Judah upon their devotion to YHWH, and dealing minutely with the matters of worship and ritual in which they were superior to the people of the Ten Tribes, against whom the judgment of YHWH is invoked (II Chron. xiii. 4-12). The chronicler also gives a detailed account of this battle, in which Judah was victorious. We are warned by the case of Uzziah (Azariah) not to hastily infer from the silence of the Book of Kings with regard to events narrated in Chronicles that such events are unhistorical. There was doubtless a continuation under Abijah of the state of feud that had prevailed from the beginning of the schism; and the tradition of a signal victory gained by Abijah over Jeroboam must have had a well-grounded basis. But the details given in Chronicles are impossible. The number of men engaged in battle is greater than the whole adult male population of the kingdoms at any epoch, and much greater than that of any armies that ever faced one another during the world's history. As a result of his defeat, Jeroboam is said to have lost Bethel and two other districts with their towns. This was at best but a temporary gain for Judah. The chronicler adds that Abijah waxed mighty and married fourteen wives, and begat twenty and two sons and sixteen daughters (II Chron. xiii. 21). The context implies that this occurred after Abijah's accession and during his reign of three years. The account is closed with the statement that these and other facts are to be found in the Midrash of the prophet Iddo. Although Abijah took up God's cause against Jeroboam, the idolatrous king of Israel, he was not permitted to enjoy the fruits of his victory over the latter for any considerable time, dying as he did shortly after his campaign (Josephus, "Ant." viii. 11, § 3). The rabbis recount many transgressions committed by Abijah against his fellow men, which resulted in drawing God's vengeance upon him more speedily than upon Jeroboam's idolatries. Thus it is stated that he mutilated the corpses of Jeroboam's soldiers, and even would not permit them to be interred until they had arrived at a state of putrefaction. Nor did Abijah show himself zealous in God's cause after all; for when, by the conquest of Bethel (II Chron. xiii. 19), the golden calves came into his possession, he did not destroy them as the law (Deut. vii. 25) enjoined. The rabbis also point out that it was improper for Abijah to accuse the whole of Israel of idolatry and to proclaim the appointment of Jeroboam as king to have been the work of "vain men, the children of Belial" (II Chron. xiii. 7), since in point of fact it was the prophet Ahijah, the Shilonite, who made him king (I Kings, xi. 37). For these reasons Abijah's reign was a short one. Mother of Hezekiah, king of Judah. II Chron. xxix. 1. Abi saved the life of her son Hezekiah, whom her godless husband, Ahaz, had designed as an offering to Moloch. By anointing him with the blood of the salamander, she enabled him to pass through the fire of Moloch unscathed (Sanh. 63b).